Danish educator, theologian, philosopher, poet, politician and hymn writer, N F.S. 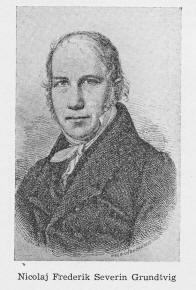 Grundtvig (1783-1872) is known as the father of Folk Schools and also the father of Public Education. Today he is also being studied as a nation builder. Grundtvig’s legacy is of special interest because a strong Danish national identity was formed from the bottom up, one which is compatible with democracy. Grundtvig was able to foster a sense of community through education, song, body culture (gymnastics and folk dancing) and an interpretation of religion which emphasizes freedom, nature, and enjoyment of life. An extremely prolific writer, Grundtvig wrote more than 1500 hymns as well as numerous books including translations of Norse mythology. A controversial minister who became a popular Bishop, Grundtvig was critical of fellow clergy and the Danish church, and became and continues to be extremely popular in Denmark. He was active in family life and very much a feminist for his time. Married three times (his first two wives died during his lifetime), Grundtvig fathered his sixth child at age 76. Traces of two Danish American churches can still be found within the merged Evangelical Lutheran Church of America: the “Holy Danes” and the “Happy Danes.” The Holy Danes represented the pietistic movement in both Denmark and then the United States. Holy Danes were not always holy, and Happy Danes were not always happy, but the two were theologically and culturally divided. Happy Danes embraced the reality of life, enjoying nature, culture, and community. Suffering, while unavoidable, is not seen as a way to please God. In contrast, the heritage of Holy Danes had its roots in the Inner Mission pietistic movement, and a more ascetic lifestyle. Today there is much less distinction between what remains of the two groups. However, Grundtvigian values and principles continue to live on and can be experienced throughout the world. Building the Nation: N. F.S.Grundtvig and Danish National Identity. Edited by John A. Hall, Ove Korgaard, and Ove K. Pedersen, McGill-Queen’s University Press, Montreal, Canada, 2015. N.F.S. Grundtvig A Life Recalled, An Anthology of Biographical Source Texts Translated from the Danish and Edited by S.A.J. Bradley, Aarhus University Press, 2008.